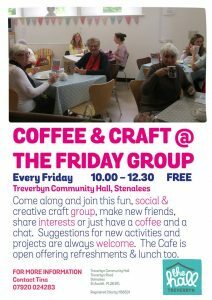 Put the fun into Friday and come and join in with this group of merry people. This lovely peer led group gives you a chance to make, create, natter and drink tea with good friends. The Friday Group hopes to bring people together and improve everyone’s sense of well being. All ages welcome so pop along and see what its all about. Activities include candle making, textiles, making dream catchers or bird feeders. Visits from professional artists or bring your own projects. If you love this group and want to stay on, how about joining in with Art for All from 12:30pm on Fridays.